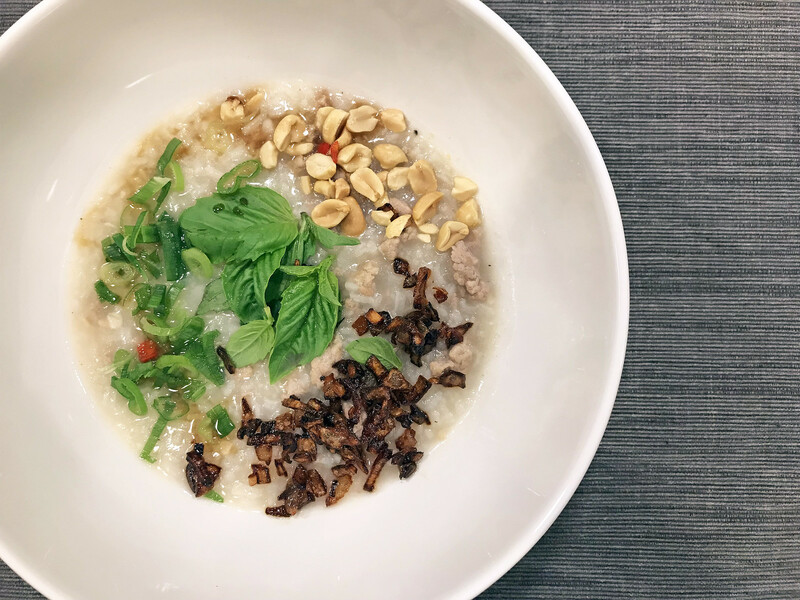 Adapted from a recipe in my weathered copy of Hot, Sour, Salty, Sweet, this rice porridge is the perfect antidote to the winter blues. Similar to Singaporean congee or Cantonese jook, it’s got that same stick-to-your-ribs heartiness as any good rice soup should. The garnishes are endlessly adaptable — feel free to adjust to your liking. 1. In a medium bowl, combine the turkey with the fish sauce and sugar, mix well, and set aside. 2. Place the water in a large heavy pot over high heat, add the lemongrass, anchovies, and ginger, and bring to a boil. Boil for 5 to 10 minutes, then add the rice and stir until the water returns to a boil. Maintain a gentle boil until the rice is tender (adding more water if necessary to keep it from sticking to the bottom of the pot), about 20 minutes, then turn off the heat. Remove the lemongrass and ginger. 3. In a skillet, heat the oil. Add the garlic and stir-fry for 30 seconds, then add the turkey and stir-fry, using your cooking spoon to break up any large pieces. Cook, stirring frequently, until the turkey has cooked through, about 7 minutes. Transfer the contents of the skillet to the soup and stir in. 4. Make the garnishes: Combine the fish sauce and chile in a condiment bowl and set aside. 5. Heat the oil in a small skillet over medium-high heat. Add the shallots and cook, stirring frequently, until golden, 3-5 minutes. Remove the shallots to a small bowl and set aside. 6. Just before serving, reheat the soup. Ladle into individual serving bowls and top with the basil, green onions, some shallots, black pepper, peanuts, and drizzle with the fish sauce-chile mixture. Serve hot. 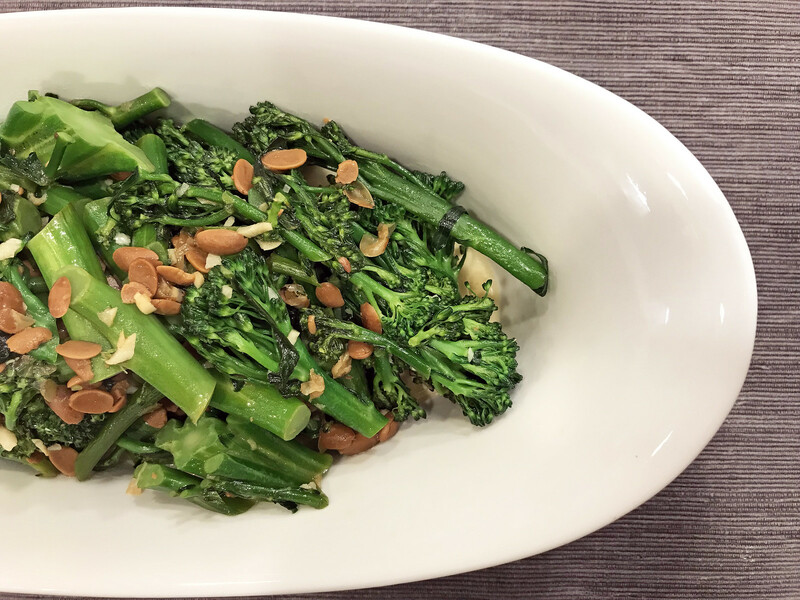 What makes this broccolini Thai-influenced? The addition of fermented soybeans, which became one of my favorite seasonings when I visited Bangkok and Chiang Mai a couple of years ago. Salty and savory, you can swap out the broccolini for any leafy vegetable with equally tasty results. 1. Bring a large pot of water to a boil and add the salt. Add the broccolini and blanch for 1 minute, then drain and set aside. 2. Heat a wok over high heat and add the oil. Add the garlic and stir-fry for 30 seconds, then add the broccolini. Stir-fry for 2 minutes, then add the fermented soybeans and fish sauce. Stir-fry for 30 seconds, then add the water, bring to a boil, and cover. Lower the heat to a low boil, cook for about 2 minutes, then remove the lid. You want the greens to be tender and still bright green. Serve warm. 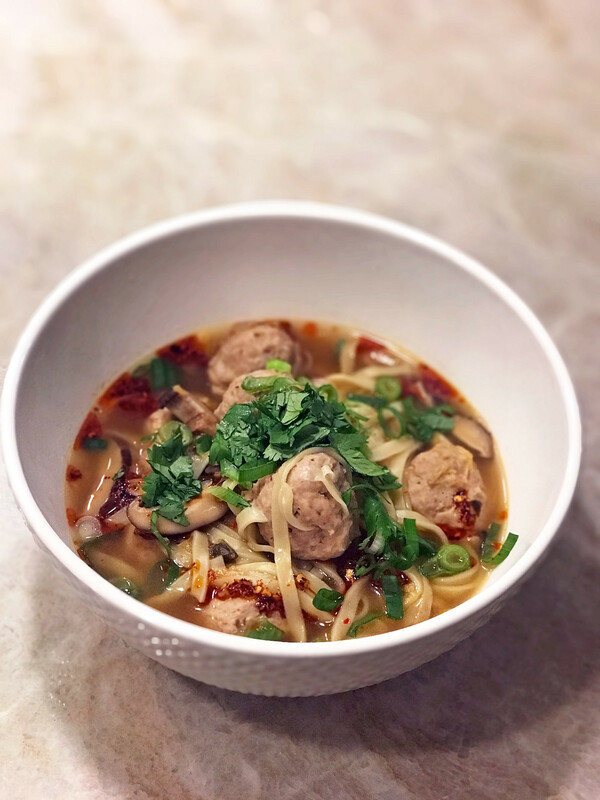 I swore to myself as I made these spaghetti and meatballs that I’d never attempt them again. I mean, this recipe is labor-intensive and time-consuming. But then I cut into a meatball and I slurped some of the noodles and sauce and you know what? 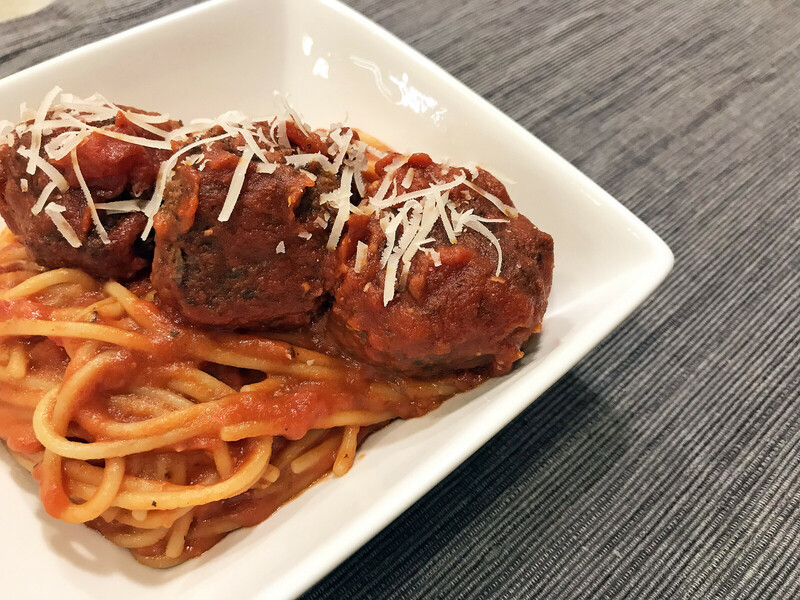 These are the best spaghetti and meatballs I’ve ever made, so uh, looks like this recipe is a keeper. And the leftovers last for days — if you can keep yourself from taking seconds. And thirds. 1. Make the tomato sauce: heat oil in a large heavy pot over medium-low. Cook garlic, stirring occasionally, until just beginning to brown, about 5 minutes. Add basil sprigs and stir to wilt. Add tomatoes, crushing with your hands, and their juices; season with salt and pepper. Increase heat to medium-high; bring to a simmer, then reduce heat to maintain a gentle simmer. Cook, stirring occasionally, until sauce is thickened and flavors have concentrated, about 1 hour. 2. Make the meatballs: In a large bowl, mix the bread crumbs with the eggs, garlic, ricotta, prosciutto, parsley, and 1/3 cup Parmesan. Add fennel to bread mixture along with oregano, nutmeg, black pepper, red pepper flakes, and 1 teaspoon salt. Mix well. Add beef and break up into small pieces. Mix gently with your hands until smooth and ingredients are evenly incorporated; be careful not to over-mix. 3. Lightly oil your hands. Working one at a time, scoop out 1/4 cup portions of meat mixture; roll gently between your hands into balls. Arrange on a baking sheet. 4. Heat 1 tablespoon oil in a medium nonstick skillet over medium. Add half of the meatballs and cook, turning and rolling occasionally, until browned on all sides, about 5 minutes total. Add meatballs to warm sauce. Repeat with remaining 1 tablespoon oil and remaining meatballs. 5. Cook meatballs in sauce (they should be mostly submerged) at a gentle simmer, gently scraping bottom of pot and adding a splash of water if sauce begins to stick, until meatballs are cooked through and tender, about 40 minutes. 6. Transfer meatballs to a clean baking sheet; cover with foil to keep warm. Pluck out and discard basil from sauce. Use an immersion blender to break up any large pieces of tomato and smooth out sauce. 7. Cook spaghetti in a large pot of boiling salted water, stirring occasionally, until al dente. Using tongs, transfer to pot with sauce. Stir, adding a little bit of pasta cooking liquid as needed, until sauce coats pasta. Transfer spaghetti to a serving dish and top with meatballs and any reserved sauce. Sprinkle with more Parmesan and serve. Thanksgiving is over, Christmas is over, and you have a ton of green beans leftover. You know, that 500-pound bag you bought at Costco thinking, I’ll use these before they start to wilt! Except it’s December 31 and you have approximately 499 pounds left. What to do? Make these simple-yet-delicious green beans in sesame miso sauce. Make as little or as much as you want. They’re crunchy, salty, savory, and super addictive. And healthy! Which is an attractive proposition considering how much cheese and pecan pie and who-knows-what you’ve (read: I’ve) been eating this week. 1. Bring a large pot of salted water to a rolling boil, add the beans, and blanch for 2 minutes, or until tender-crisp. Drain the beans and set aside to cool. 2. Meanwhile, make the sauce: In a bowl, mix the tahini with the miso. Stir to blend completely and thin the mixture with some of the dashi stock. 3. 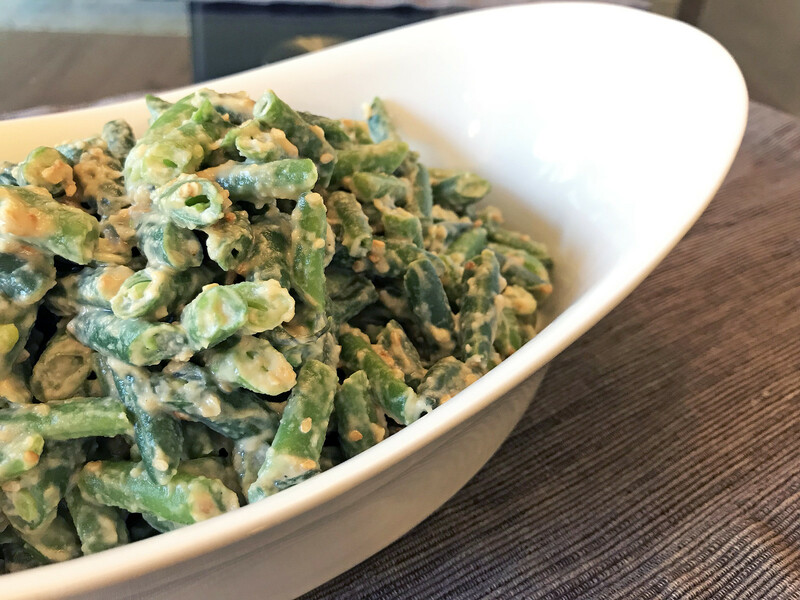 Cut the green beans into 1-inch lengths and toss with the sesame-miso sauce in a bowl. Garnish with sesame seeds and serve.